I have collected cars for 35 years. THis is one of the classics from my personal collection, see others at,www.gccc.us The pictures of this beautiful 1968 Pontiac GTO simply don't do it justice. 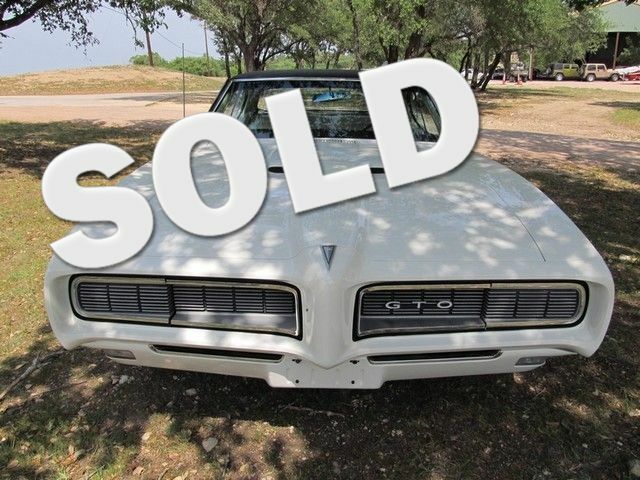 But it's a wonderful example of what a GTO should look like because even through its 43 years old, it looks like it just came off the showroom floor. This car is great to drive and very mechanically sound, so you're not going to have any worries traveling from one location to another. While the Edelbrook valve covers were apparently added at a later date, this car has all matching numbers and a lot of original paperwork and records to go along with it. In fact, a PHS (Pontiac Historical Society) report is available upon request.This beautiful GTO sold at Barrett Jackson circa 2005 for $45,000. Have the paperwork. Not but a couple hundred miles on it since then and could not have looked any better then than it does today. An Outstanding GTO in ANYONE's book! ADDITIONAL EQUIPMENT HO4BBL 360HP Carb ?? ?AM Radio w/8 Track Tape Player ?? ?His and Hers Turbo Hydromatic Transmission OPTIONAL EQUIPMENT ?? ?dual exhaust ?? ?Rally II wheels ?? ?Rally gages and clock ?? ?deck lid remote control ?? ?retractable hide away lights It has hide away lights, the original 400 his/her shifter with console, bucket seats, cold a/c, power brakes, power steering, dual exhaust, factory rally wheels and so much more. The Endura front end really sets this car apart from other GTO's and the 400 (HO) 360HP) 4-BBL V8 engine with turbo hydromantic transmission will get you where you want to go in a hurry.